Attendance at this year’s convention was 91,460, down slightly from the 92,912 that came in 2018. Employees of local television stations that attended the recent NAB Show walked into a quagmire of technologies and Internet Protocol (IP)-based system solutions intended to address a wide range of decisions facing broadcasters. For them, many appeared either out of reach in terms of price or out of mind when it comes to practicality. Yet, as has been the case the last several years, it was clear that most of the innovation and experimentation this year is occurring among the large content delivery networks and new OTT players using the latest IT-centric delivery models based on micro-services and IP standards for content delivery, particularly SMPTE ST 2110-6. The benefits of these new technologies is fast file transfers, flexibility, scalability and the freedom to try new things with minimal risk. There was also much talk of delivering live events this way, which had been deemed problematic even two years ago. Telestream showed a system called OptiQ—using technology it acquired when it purchased IneoQuest in 2017—that recently allowed a content distributor in Asia to establish a virtual channel for the past World Cup in five minutes, according to Ken Haren, one the company’s marketing executives. It uses a series of micro services to establish preferred processes that can include automated transcoding, channel monitoring and redundant system repair. A year earlier a similar channel took five months to launch. Virtualized channel-as-a-service delivery technology allows operators to simply click a few buttons to set parameters and launch a channel from one location to another in any region of the globe quickly. Similar virtualized channel-as-a-service delivery technology was on the floor from Aperi, Grass Valley, Imagine Communications, MediaKind, NewTek and Qligent, to name a few. Users simply click a few buttons to set parameters and a channel can go live (or be turned off) from one location to another in any region of the globe quickly. “The clear value of deploying this technology is that a media organization can spin up a channel, monitor its performance in real time and make adjustments accordingly without committing significant resources until the results meet the expectations,” said Mike Cronk, vice president of Core Technology at Grass Valley. Among a number of new products, the company announced GV Fabric Core, an IP signal routing infrastructure that includes Ethernet switching technology from Mellanox Technologies. IP is also having a positive affect on production resources. 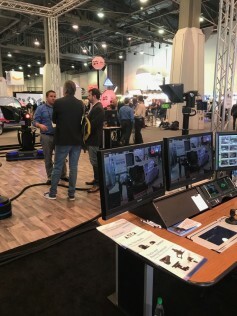 At the show it was announced that the Mobile DTV Group has built an all-IP truck called “45 Flex” that company owner Phil Garvin has said leverages an IP infrastructure both for its flexibility and its resulting lower weight (an important considering in the mobile production truck sector). The truck includes LDX82 Premier IP/HD cameras and a K-frame X IP switcher from Grass Valley, HD lenses from Fujinon, IP Replay servers and networking technology from EVS and a Calrec Artemis Beam Audio Mixer (64 faders and 256 routable inputs via IP) to produce the highest quality uncompressed HD (1080p/60) imagery for live sports events. 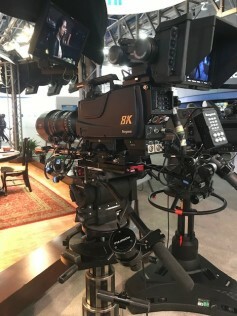 There were new 8K, 4K and HD HDR broadcast production cameras from the likes of Blackmagic Design, Hitachi, Ikegami, Panasonic, Sharp and Sony while JVC remained focused on the lower end with its new ConnectedCam HD acquisition and on-board transmission camera. The later also showed news stations how they can send content back to the station using the public Internet. In addition to a variety of HD cameras with HDR acquisition capability, several 8K “broadcast” cameras were shown on the show floor. Audio console makers like Calrec Audio, Solid State Logic and Wheatstone Corp. showed AES67 and Dante audio networking connecting virtual control surfaces that leverage the cloud to allow mixers in separate locations to gain aces to a single remote console. Some of these, like Calrec’s VP2, were displayed in the form of a “headless” console with a 4RU processing unit that can be easily transported to a production site. At many of these companies’ exhibit booths 8K monitors displayed colorful pictures, but few were actually considering a purchase. The ultra-high-definition format is said to be a good fit for outdoor stadiums with large display screens, although NHK plans to use numerous Sony 8K cameras for the upcoming Tokyo Summer Olympics in 2020. New production switchers that support both 12G SDI and IP were also demonstrated on the show floor, allowing video producers to leverage both types of signals to their specific applications. Grass Valley said it just finished a record year in its K-Frame switcher sales and that 77 percent of its revenue comes from live production customers. Ken Truong, president of FOR-A Corp. of America, said his company remains optimistic about 12G infrastructures and production equipment being used by media organizations “that don’t yet fully understand IP and want to continue working the way they always have.” At NAB the company showed a full line of 8K-compatible equipment including a (single-link) switcher, router and multi-viewer, server and CG system. It recently supplied an end-to-end 12G (4K) system to the Miami New World Symphony, which famously projects its classical music performance on the outside of its massive building for public consumption. Ross Video showed single-link 12G/UHD switching capability in 2 and 3 SD/HD ME versions of its Carbonite Ultra UHD production switcher. Ross Video also showed single-link 12G/UHD switching capability in 2 and 3 SD/HD ME versions of its Carbonite Ultra UHD production switcher. Along with multi-ME UHD functionality, users have access to 18 x 12G inputs /16 x 12G & 2 Quad-Link 2Si inputs and 10 x 12G outputs. But business has been tough for equipment suppliers. Industry consolidation continues with the announcement just prior to the NAB Show that Vizrt had acquired NewTek. Vendors at NAB said they are faced with a very competitive landscape. To address this dilemma, Imagine has separated out its advertising technology business from its infrastructure division in the hope of focusing its efforts on what it sees as its more promising parts of the broadcast business. In doing this, Cotny said they’ve changed 50 percent of Imagine Communications’ management team and added several individuals from outside the broadcast industry. At the show it announced a major ad tech win with Nine Network in Australia. Interestingly, Imagine also announced a new equipment maintenance program to help customers get more life out of existing equipment and build an on-going close relationship. Cotny said the program would include servicing equipment made by other suppliers. Illustrating just how deep IP has permeated the traditional SDI broadcast business, even system integrators are taking advantage of what IP system deigns have to offer. Germany-based Qvest Media, a veteran system integrator, showed off a new strategy it is implementing for its customers that includes very little on-premise hardware and a suite of virtualized services that help operate, monitor and upgrade a broadcast facility with very little human intervention. Qvest recently completed a large project for Deutsche Welle in which it designed and deployed a scalable and modular cloud-native architecture and infrastructure. Content from the German broadcaster reaches more than 100 million people across all continents. All of the new components have been implemented as a virtualized software architecture on the premises of the Deutsche Welle data center. This allows the German broadcaster to pursue an “online first” strategy that takes advantage of collaborative workflows that are used to aggregate and produce content for efficient multi-platform distribution. The virtualized solution includes Sony’s Media Backbone Hive production system, the Qvest.Cloud Ultimate multi-cloud management platform and the workflow orchestrator Mayam Tasks. Qvest.Cloud serves as the execution layer for cloud containers and for system monitoring. “At Home” or Remote Integration (REMI) production continues to grow in acceptance across many segments for the news and sports worlds. Equipment vendors have recognized this and at the show they introduced new systems that are now smaller (some in a 1 RU box) and even more portable. This means a crew of two people could show up to a venue with a small car, open their trunk, plug in their cameras, and begin transmitting camera feeds back to their home base—be that across town or around the world. This cost-efficient production strategy is growing rapidly and supporting all levels of live production. 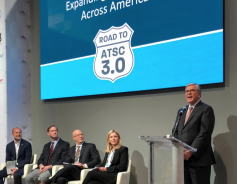 At a press conference, ATSC 3.0 was said to be launching in 40 markets by 2020. The NAB's President and CEO Gordon Smith is seen here at the podium discussing new opportunities for local broadcasting. Local broadcasters were not totally forgotten at the show. The emerging ATSC 3.0 TV transmission standard continues to move forward, despite resistance from both the ABC and CBS networks. The standard is designed to combine over-the-air with over-the-top content and bring new revenue streams to local stations. At a press conference it was said that TV station groups and public broadcasters in 40 U.S. markets would roll out the new standard by the end of next year. At the NAB Show dozens of exhibitors showed ATSC 3.0 products or services. Station groups said to be involved include Fox Television Stations, NBCUniversal TV stations, Univision, Spectrum Co. (including Sinclair Broadcast Group) and members of the Pearl TV Group—a coalition of broadcasters and manufacturers testing ATSC 3.0 in the Phoenix Model Market. ATSC 3.0-compatible TV sets and devices capable of receiving these “next-generation” signals are expected to hit the market sometime in 2020. Leaving the show, local TV station engineers had to come away with a healthy dose of confusion as to which technology direction they should choose to move forward. In many cases a large corporation that owns dozens of stations across the country is now making that decision. The good news is that adopting IP sooner than later could allow them to try new distribution models and conserve costs in the process. Now, if they could just figure out what a “VM Guest OS”* is and what it means to their way of working.